The Arborsafe Chainsaw Gloves are made from hide leather with reinforced aramid stitching and feature enhanced cut protection on the left hand for peace of mind and a reliable chainsaw glove. 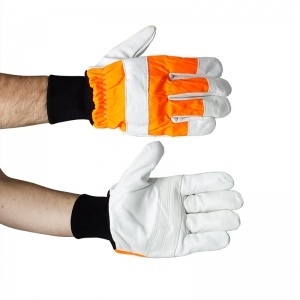 These chainsaw safety gloves are designed in a striking orange-and-grey colour scheme for enhanced visibility, and provide protection without sacrificing dexterity and the 'feel' for the chainsaw. 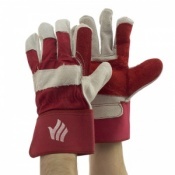 The Arborsafe Chainsaw Gloves also offer an elasticated cuff for extra comfort and warmth while ensuring the hands are protected from dust and chippings when operating a chainsaw. 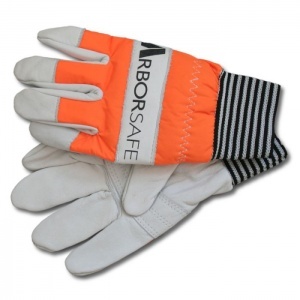 The Arborsafe Chainsaw Gloves are sold as a pair. 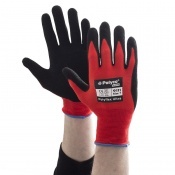 These chainsaw protective gloves have also been categorised as Type 'A' Class 0 when tested against the EN381-7 standards. 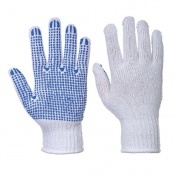 In simple terms, this means that the gloves will resist cutting when in contact with a moving chainsaw chain up to a speed of 16 metres per second. LENGTH - measure from the bottom of the hand/palm to the tip of the middle finger. CIRCUMFERENCE - measure round dominant hand below knuckles, excluding the thumb, and make a fist. Please note that the Arborsafe Chainsaw Gloves may be supplied with one of two cuff styles; please see the above images for examples.